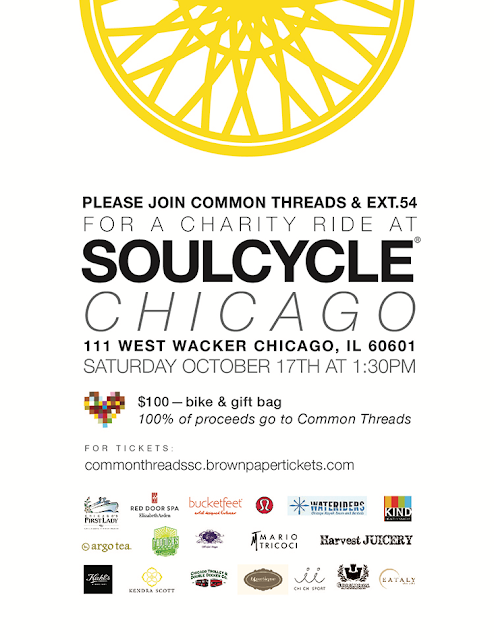 Many of you know I LOVE Soul Cycle and supporting my favorite Chicago Charities, like Common Threads. I hope you’ll join me at SoulCycle for a Common Threads Charity Ride to help this amazing non-profit organization reach their goal, by providing funds to help maintain the Common Threads Garden in Hyde Park. Common Threads is an organization dedicated to teaching kids, families and communities to cook for a healthier life. With programming in 6 cities nationwide, they served over 48k students this past school year and summer, reaching over 16k students just in Chicago. This coming year they are trying to double their impact, ultimately getting a million kids cooking for life by 2020. The ride will take place October 17th at 1:30pm at SoulCycle Loop (111 W Wacker), the fabulous friend and soul sister Aya. Tickets are $75 (all proceeds go to Common Threads) and include bike, shoes, water, super fun gift bag and raffle prizes. (Invite below).